If we think about what we have seen of Peter in the readings for Holy Week, this passage from Acts might leave us asking a question: What has happened to Peter? We remember him on Palm Sunday, denying the Lord three times and fleeing when Jesus was crucified. Today’s Gospel tells us that Mary Magdalene had to go fetch Peter with her news, because he and the other apostles were hiding “for fear of the Jews” (Jn 20:19). Yet here we see him boldly preaching the Good News (to the same Jews who had terrified him) that death could not hold Jesus. We see the effects in him of the Resurrection—more clues to its reality. Peter testifies not only to “Jesus of Nazareth,” Who “went about doing good” (Acts 10:38), but also to the fact that he “ate and drank with Him after He rose from the dead” (Acts 10:41). The commission he and the other apostles received from the Risen Jesus, confirmed by the anointing of the Holy Spirit at Pentecost, turned Peter inside out. 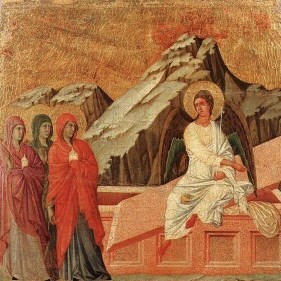 What a transformation from the befuddlement of the empty tomb. Freed from his cowardice and fear, he wanted the world to know that Jesus is alive and that “everyone who believes in Him will receive forgiveness of sins through His Name” (Acts 10:43). This entry was posted in B, Easter, Sunday Lectionary Readings, Year. Bookmark the permalink.